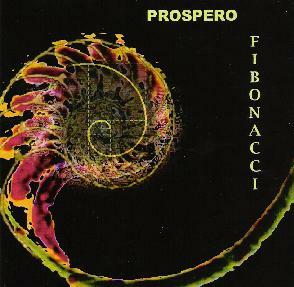 I chose this CD because of the fact that it mentioned Fibonacci, and for those of you who do not know that name I will briefly describe this sequence by what is on the cover of this CD. The Fibonacci numbers are a self-creating recursive pattern. Each number is the sum of the previous two in the series. As the numbers grow larger the proportion between one number and the next approaches Phi, the number that the Greeks revered as the Golden Mean, which they saw as the most beautiful and perfect geometric ratio. This mysterious sequence of numbers has been connected to many natural phenomena, to ancient constructions and patterns of turbulence. It is also related to esoteric systems of Magick. So this is why I have shown an interest in it, because everything that you hear on this CD has a correspondence in the Fibonacci sequence. But who cares, what's it like? Very spacey throughout to put it simply, and a must for Tangerine Dream/Klaus Schulze fans. The atmospheres that Prospero, aka JC Mendizabal, produces throughout this CD are strange and meditative, hypnotic and journeying, and really just how I like electronic music. I could not say that I realized JC Mendiuzabal's calculations offhand, and heard all the correspondences to the Fibonacci sequence in this music, because it is not why I listen to music, to count phrases, tempos, beat structures, or indeed count anything other than the joints that I smoke while listening to it. But I do not deny that it is there, because it was this curiosity that drove me to choose it, and to listen to the music, just to see if it was as strange and spacey as I expected it would be. The good news is that it is all of that. I hear elements of Pink Floyd "Heart Beat Pig Meat" style, and I hear an abundance of Tangerine Dream/Klaus Schulze. This is very much a headphones electronic meditation album. It is totally focused on taking you, the listener, on a Fibonacci journey, and it I can say that it fully completes that journey with total hypnotic self-creating ambience. There are 14 seamless tracks to drift over you, capture you, and show you the workings of a keen mind and a faultless sound creator at work. It is a pleasure to review a CD such as this, because I will play it again rather than review it and put it on the pile with the rest of the chaff. So I would definitely recommend it to the space meditation cadets, and to those who are currently studying the hermetic/esoteric systems of John Dee or the O.T.O. Not that it would be useful, but rather good music for rites if needed. Only joking…. But why not!!! Contact via snail mail c/o Black Note Music; PO Box 3251; Daly City, CA 94015.